PetFinder.my wins DiGi WWWOW Awards! Announcements, Notices and Contests General announcements, latest developments at PetFinder.my and contests with cool prizes! 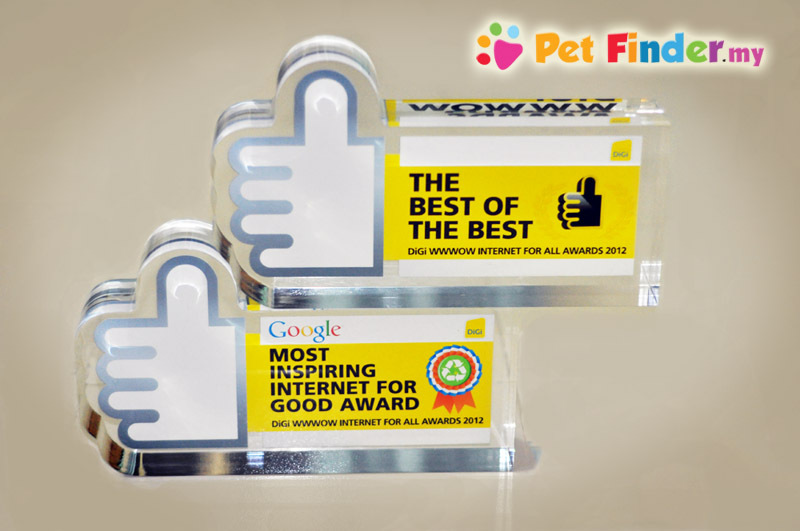 PetFinder.my won DiGi WWWOW's Most Inspiring Internet For Good Award, and the BEST of the BEST Award 2012! A sincere and big thank you to DiGi and all the animal lovers for your awesome support. This award belongs to all the animal lovers and rescuers that have helped turn PetFinder.my's dream of helping homeless animals into reality. Thank you to the organizers, judges and voters for the recognition and acknowledgement of animal welfare's importance. We will continue to work hard and do our best for the animals! Re: PetFinder.my wins DiGi WWWOW Awards! "All I'm saying is, kindness don't have no boundaries.” from Kathryn Stockett's book - The Help"
Thanks for your support, Casis!